Whatever you are grilling this weekend, add this Elotes Mexicanos recipe. It takes that sweet, summer corn to a whole new level. I just love corn-it’s my ultimate BBQ food. (Right up there with homemade ice cream!) and I just can’t seem to get enough. Whether it’s just boiled and lathered in butter and salt or grilled, I could eat several ears and call it a meal. I’ve always loved getting Elotes at street fairs and festivals but now I make it at home and it’s super easy and just as delicious! It’s up to you if you want to grill the corn in the husks or not, but if you do, be sure to soak them in water before – dry husks can go up in smoke quickly! I usually just go ahead and shuck the corn, and clean it well, getting rid of those little hairs (so the guests don’t have to) and giving the cobs a quick rinse before putting them directly onto to the grill. The tender, summer corn is loaded with sugars that are going to caramelize on the grill giving your corn an extra sweet flavor. It only takes 10 to 15 minutes over medium-high heat for the corn to be perfectly cooked during which you can whip up this amazingly delicious toppping. 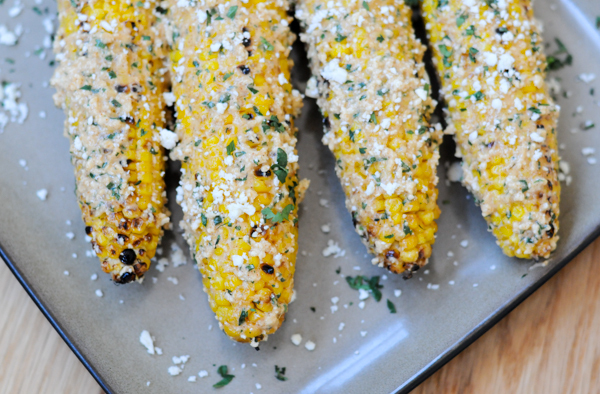 So spice up your weekend BBQ with this tasty recipe for Elotes Mexicanos. Elotes Mexicanos Recipe - What's on the Grill? ½ cup Cotija cheese (or Feta cheese), crumbled, plus more for sprinkling over the ears. Prepare a grill or grill pan with medium high heat. Shuck the corn, cleaning the ears of all the fibers and place directly on grill. Cook for 10-15 minutes, turning occasionally, until the cobs are starting to become a bit blackened but with the majority of the kernels bright yellow. While the corn is on the grill, in a medium bowl mix together the mayonnaise, Mexican Crema, Cotija cheese, cilantro, garlic and the ancho chili powder. Slather each ear of grilled corn with a generous tablespoon of butter and several spoonfuls of the sauce. Drizzle a bit of the lime juice over the ears, followed by a pinch of salt and a healthy sprinkle of cheese and the remaining cilanto.